So back at the start of 2015 I decided to set some Blogging Resolutions for myself (find post here) and then back in early July I did a mid year look back to see what I achieved and what I hadn't yet (find post here). One of the things I wanted to do was a Box Swap with someone as they sounded like so much fun which leads us onto this post! The lovely Emmy from Emmys Beauty Cave who is one of my favourite bloggers who's blog I have been reading since I've started got in contact with me saying that she'd love to do one, so we exchanged things such as our skin type and favourite shades of lipsticks and our budget and got shopping! On Monday the postman knocked my door and handed me all my little gifts from Emmy and I was so excited it was like Christmas or even an early Birthday gift! As I was too excited to wait I didn't take a proper picture with my camera with everything wrapped but I did snap one for my Instagram! (See picture here) Everything was wrapped so cutely and it just made me even more excited! She even presented it in such a cute little box she basically thought of everything. Now for all the amazing gifts that were inside! The first thing on top was the cute little fluffy flower pen. Is it sad that the first thought that came into my head when I seen this was 'Yes! When I take photos of my Blogging notebooks now I have a cute pen to include instead of just a plain one!' but really how cute is it! It's also a really nice pen to write with, I don't even know if that's a normal thing to say but I'm really fussy when it comes to pens but I really like this one! Next up she sent me some Facemasks which made me giggle because I had done the exact same! Gotta love some pampering. I got 3 of Superdrugs own range ones which I'm so excited to try and a Vitamin E Body Shop one which I kind of freaked out over because you can't get any of The Body Shop products here! A brand I've tried only a few things from because again you can't get it here is MUA but Emmy being brilliant sent me 3 of their items which I am so excited to try! 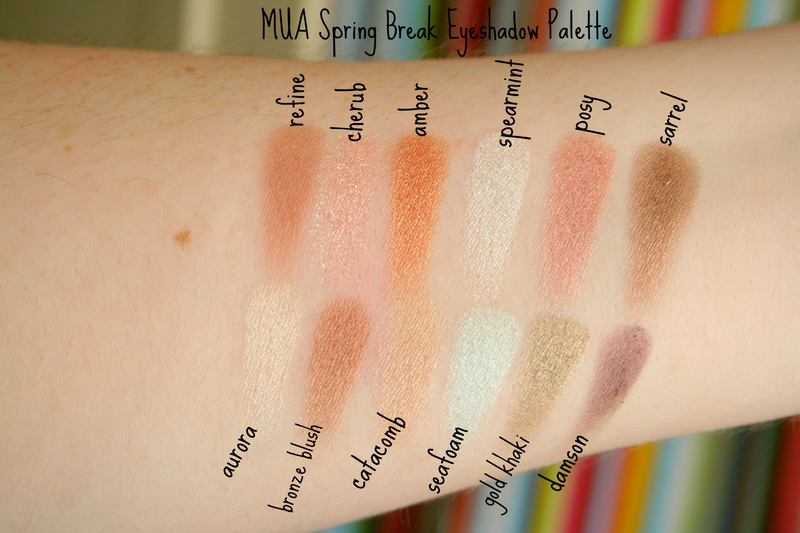 I got the Spring Break Eyeshadow Palette which is absolutely stunning! I adore wearing colours on my eyes as well as the obvious Bronze shades and this palette is perfect for both! I am obsessed with the look of the shades! She also kindly sent me over a Sweet Sheen LipBalm in Cherry Bomb which is such a beautiful shade! 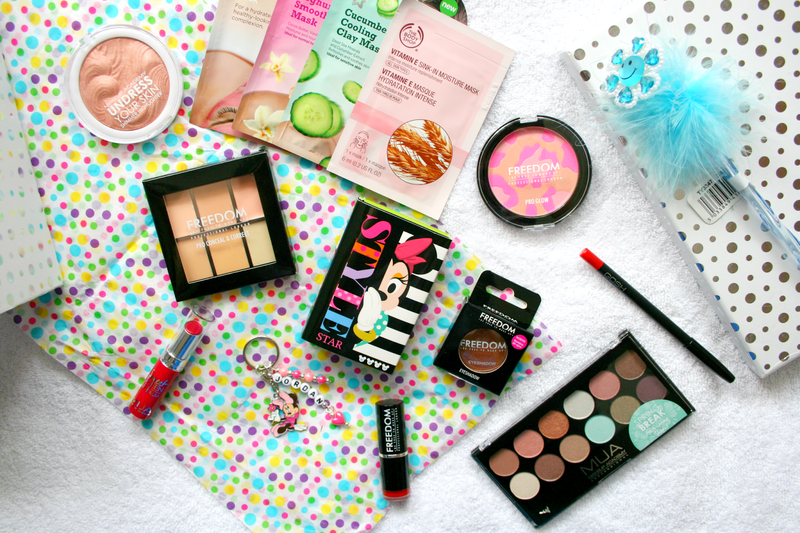 Emmy reviewed some of these on her blog so you can find out her thoughts on them here. Finally and something I legit stared at for a solid two minutes the Undress Your Skin Shimmer Highlight in Opalescent Amber I am literally in love with this, just look at it! It is so stunning and when I swatched it oh my goodness, I just know I am going to be wearing this everyday because it is so beautiful. 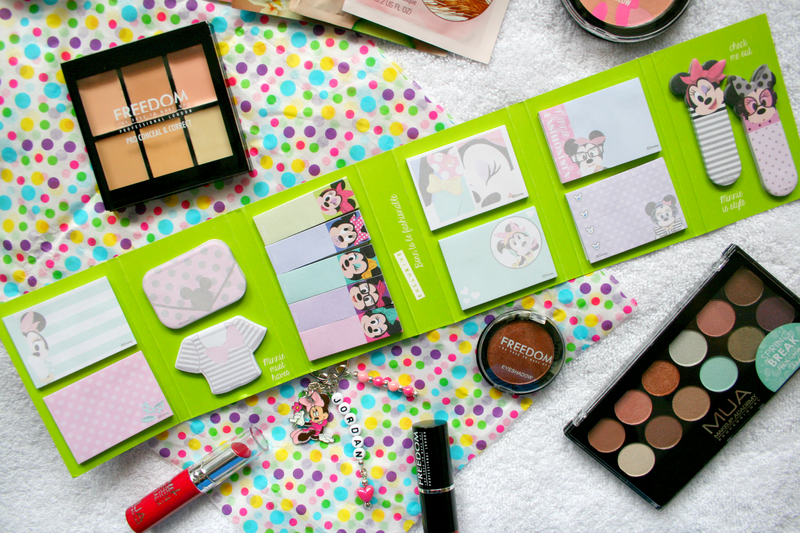 Along with all those wonderful gifts also inside were four products from the Freedom Makeup range. 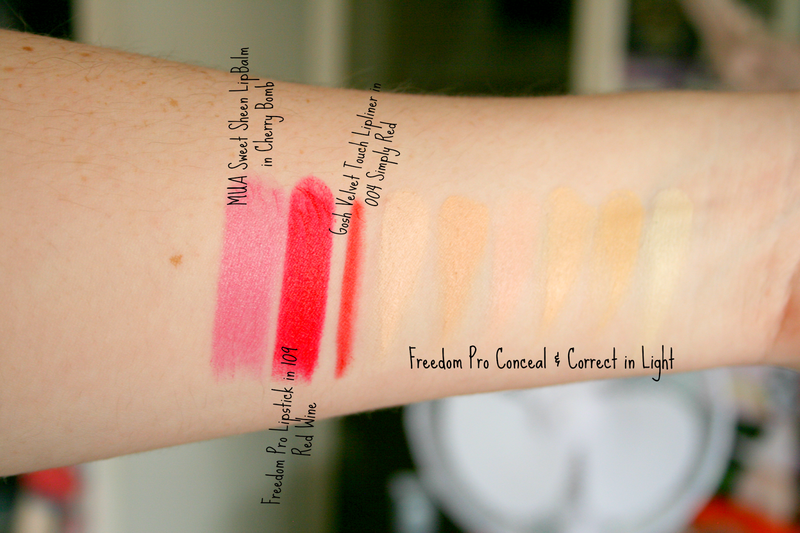 The first thing I unwrapped was the Pro Conceal & Correct Palette in Light which I am so excited about and couldn't have come at a better time due to all my correctors to run out! I was also sent a Lipstick in 109 Red Light which is such a beautiful red shade I'm in love with it and cannot wait to start wearing it. I also got the most beautiful Eyeshadow in shade 218. This is honestly such a gorgeous bronze colour and oh my goodness I just cannot stop staring at it. 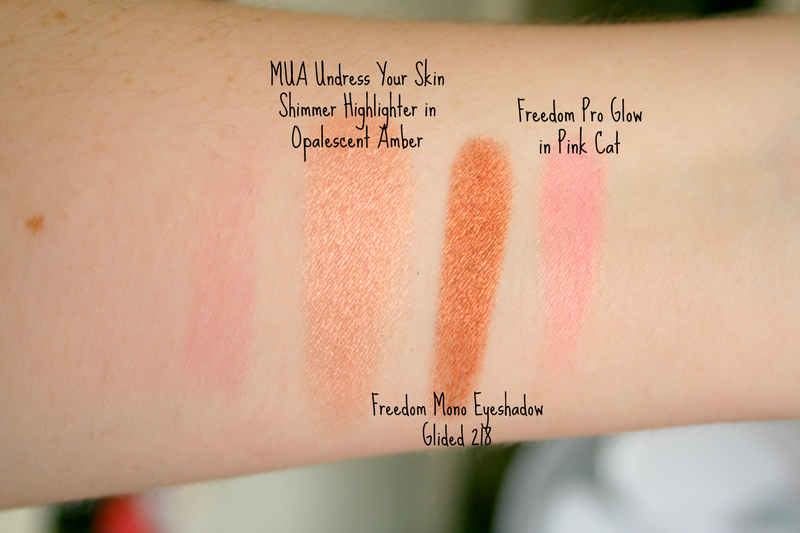 Finally Emmy also sent me over the Pro Glow in Pink Cat and how cool does this look!? I definitely do not own anything like it which I'm so excited about. At this stage I was over the moon with all the amazing gifts but I still had more to open it was literally such an exciting ten minutes opening all of these lovely gifts and just staring at them! I received a Gosh Lipliner in 004 Simply Red and this is legit the most amazing lipliner I have ever owned in my life. It's so buttery and the colour oh my the colour is just to die for! It's also waterproof like WATERPROOF how amazing I am legit blown away. Finally the last two items are Disney related because we both ended up realising we were obsessed with Disney. Emmy sent me over this absolutely adorable little Minnie Mouse Sticky Notes Book which I absolutely adore because I always use sticky notes to remind myself of what I have to take pictures of etc and there are so many so I wont be running out for awhile, and best of all they're Disney and adorable. 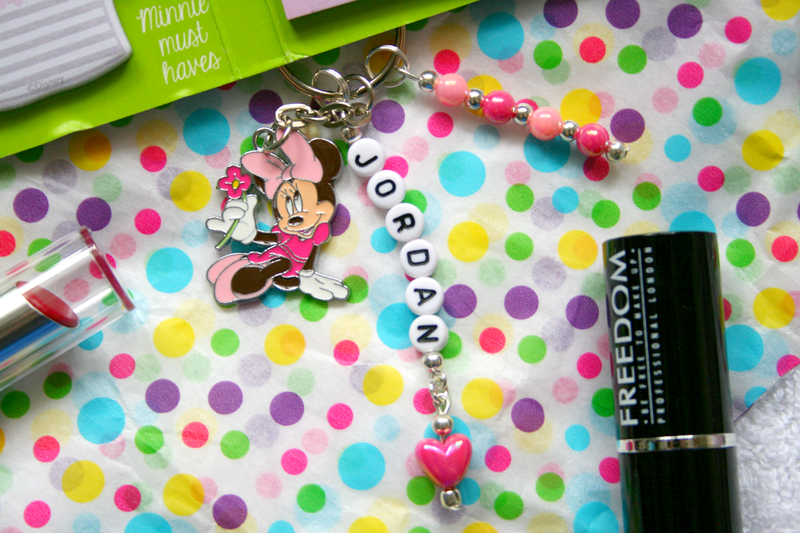 Finally she sent me over a Personalised Name Minnie Mouse Keyring which I just thought was the nicest gesture ever! I absolutely adore it and it's now on my keys where it shall stay. Everything that could possibly be swatched! How absolutely stunning is everything. A HUGE thank you once again to Emmy for all these absolutely amazing gifts, I love every single one of them and I'm so super duper excited to start trying everything out now that everything has been photographed. Make sure you check out Emmy's blog here as I absolutely love it. You can also find her on Twitter here and Youtube here! You can also find out what was inside the box I sent Emmy here! Have you ever done a Box Swap? The GOSH lip liners are my favourite, I love them! Oh wow, she got you some really good stuff. I'll keep in mind about the GOSH lip liner, I have been making a list of GOSh products to try so the lip liner will be added into it. 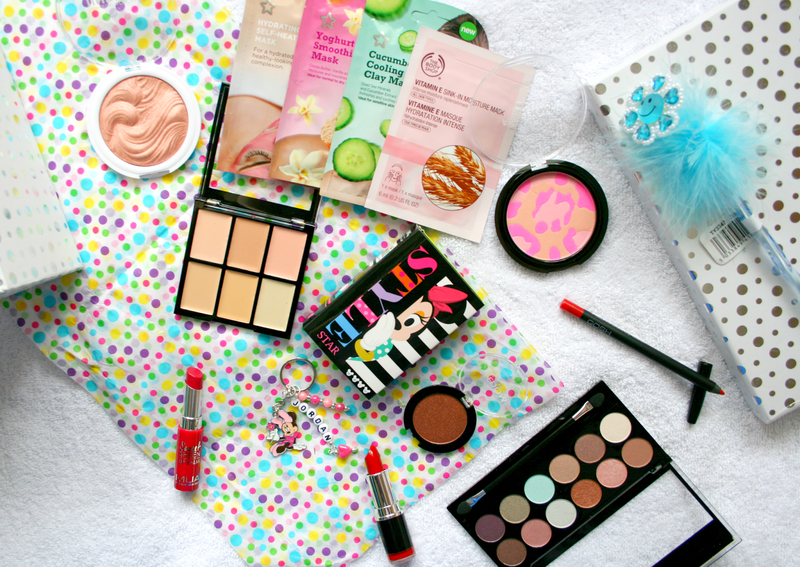 I haven't tried any of the products, but evrything looks just beyond amazing! And this Disney keyring is my favorite! Emmy sent you such sweet and thoughtful gifts! I would love to do box swap one day too) This is the most exitig post, seriously! So many amazing things in one post!